John McCabe’s substantial String Trio, written in 1965 for the 60th birthday of Alan Rawsthorne is here re-released by Prima Facie Reccords, together with his String Quartet No. 2 of 1972. These works, coupled with the Trio for Violin, Viola and Cello and String Quartet No. 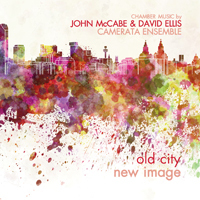 1 by David Ellis, were first recorded by the Camerata Ensemble and released in 2003 by Campion, who have kindly made the recording available for this reissue. It is in fact the second recording of the McCabe String Trio, which lasts nearly 25 minutes. This was first recorded by the Cardiff University Ensemble on Argo in 1965, soon after the work was written. The three other works were world première recordings. McCabe’s String Trio was one of the early works which helped to make his name as a composer. McCabe and Ellis both came from the Liverpool area, and both attended the famous Liverpool Institute, at the top of Mount Street, in the shadow of the great Anglican Cathedral. Both composers studied with Thomas Pitfield at the Royal Manchester College of Music. Both won the Royal Philharmonic Prize. While McCabe went on to have a dual career as composer and pianist, Ellis worked from 1964 at the BBC as a music producer, having responsibility for programme planning and administration of the BBC Northern, later Philharmonic, Orchestra. In 1977 he became Head of Music, BBC North. His Trio is also an early work, written in 1954 when he was 21. His Quartet is the latest of the four works on the CD. It was commissioned by Alun Hoddinott for the Brodsky Quartet, and first performed at the Cardiff Festival of Music, December 1980. McCabe’s quartet, numbered 2, is in fact the first in all but name, being preceded by a student work, Partita for String Quartet. Reissued by kind permission of Campion Records. As a composer, John McCabe (1939-2015) enjoyed international stature. 'The Chagall Windows' and 'Notturni Ed Alba' are among his leading works, with much chamber, keyboard and vocal music. 'Cloudcatcher Fells' is considered to be a classic of the brass band repertoire. Among John’s most recent works were the 'Symphony On a Pavane' (London Philharmonic Orchestra), 'Symphony No. 7', 'Labyrinth' (Royal Liverpool Philharmonic) and his Cello Concerto, 'Songlines' (Truls Mork and the Halle). John was appointed CBE for services to British music in 1985. In 2006 the Incorporated Society of Musicians honoured him with their Distinguished Musician Award. In May 2014 he received the IVOR Award for Classical Music from the British Academy of Songwriters, Composers and Authors, while the Iles Medal was awarded to him in September 2014, for services to the brass band movement. David Ellis (b. 1933) studied at the Royal Manchester College of Music from 1953-1957. From 1964 to 1986 he worked at the BBC as a Music Producer. He now devotes his time to composition, with time set aside for CD production work.